Activities that correspond to the Lean Startup method are associated mainly with startups and the IT industry. Their use however, brings undoubted benefits also in other areas such as marketing and public relations activities. Such activities are adopted not only by startups but also by SMEs and corporations. This method enables to perform fast and effective activities, expanding knowledge relating to recipients, better adjustment of marketing channels to campaigns as well as (or most of all), to reduce costs of activities and shorten the time-to-market. Sounds good? Here are a few simple Lean Startup rules that you can start implementing tomorrow! A typical process of acquiring press publications starts from defining the article / report / material subject, developing it, preparing graphics and a database of editorial offices that could be interested. Then, it is distributed and the appropriate people are contacted regarding publication. This process is time- and labour-consuming. How to simplify the process and reduce labour while increasing effectiveness of PR activities? The MVP — Minimal Viable Product, concept transferred into the area of PR can be a solution in this case. According to it, a minimal product version that will include the key features providing value to the users, should be developed. The aim of designing an MVP is fast and cheap testing whether the product responds to the needs of users and if they want to buy it. What type of press materials are MVPs? A ready article is a full product. The title and conspectus of an article is a good starting point to an MVP. Nevertheless, you can take it one step further and prepare only a brief email to the editorial office, containing information about the leading subject of the material as well as elements that will make it unique and valuable for recipients of a newspaper or website. A message with an enquiry whether an editorial office would be interested in such a publication will be sent to the selected journalist /editor. This is a great test whether your material will meet the needs of press. What will you gain? There are many benefits. You will learn the needs of journalists — usually, a returned mail includes feedback specifying their expectations from a material, details about a given topic, trends that their readers are interested in. Thanks to the above, you can develop a publication that will be adjusted to their needs. You will increase the effectiveness of PR activities — a journalist with whom you will arrange the content of a press material will be more willing to publish it if it is received from you. Additionally, your relation with the journalist is based on a partnership, and thus it is stronger. You save time — you prepare only those materials in relation to which you are certain that will be published. Hence, your activities will be more effective. The MVP concept may be freely implemented into other areas of marketing and PR activities. Instead of preparing a full website, develop its mock-up and test it with potential customers. Before creating a cycle of Facebook posts, test interest in the subject by publishing a single post or several posts. Preparing an advertisement campaign should be preceded by tests of a single creative among a group of users. Catchy slogans, controversial formats, emphasising price, product presentation — these are some of the methods applied by marketers when creating advertisement. The Lean Marketing trend follows a different path and proposes that the unique value of your brand should be exposed in marketing materials, slogans and visualisations. How to find out what the UVP / USP is of a product that you are advertising? A response to what your value proposition is can be often found out from your recipients. When studying their needs, conducting in-depth surveys or preparing focus groups, listening to the problems that your product solves, you can identify what the unique value is for your recipients. 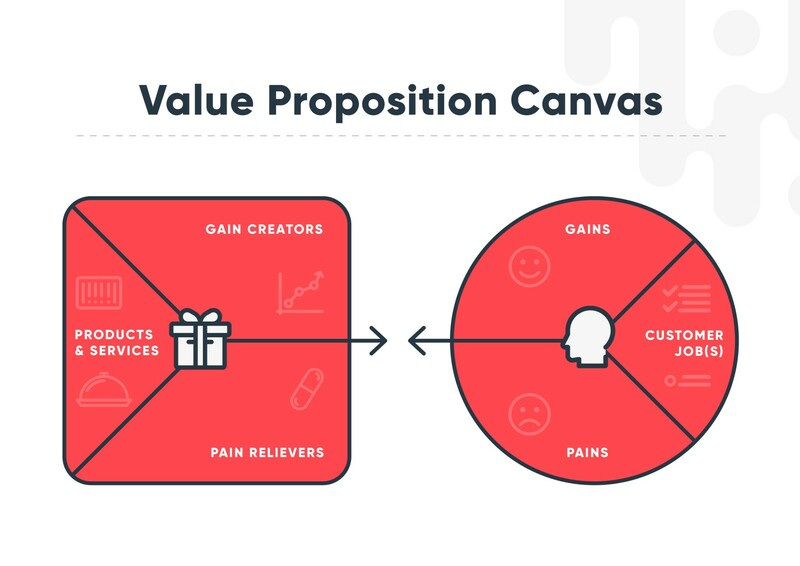 You can also work on UVP using the Values Proposition Canvas, where you will first describe the following in 3 groups: problems that a recipient faces in our area (Pains), what the recipient wants to obtain (Gains) as well as the jobs to be done. Then, think about your reliefs to the Pains of the customers and what you can offer them from the components that they are looking for in a product. Also, how you can do work for them to provide value. Example: a company producing water gel for household plants is one of our customers. The primary Pain of people in this target group is lack of time to water plants or forgetting about it. Due to the above, their sense of aesthetics is worsened because plants dry and they look bad, while an attractive look of a home is very important to them. One of the solution propositions is offering a text message reminder service, besides the gel (which extends the time when you do not have to water plants up to 3 weeks). What will be the USP in this case? The recipient does not buy gel and a service — they buy convenience. How to implement this into advertisement activities? Most of all, this changes the method of presenting a product. You no longer speak about its features or properties but about the value it provides to a recipient. This can be visible at the level of texts, slogans and also at the level of visualisations, campaign assumptions and also micro-products and services completing your offer. Adjusting your advertisement message to UVP / USP is key in order to reach a customer. It increases the sales effectiveness of advertisements and reduces costs of reaching a customer. When you know the Unique Value Proposition, you are also able to build a stronger brand for the product. In the case of this customer, advertisement should present the vision of how the comfort of life of the user increased, thanks to his/her home being decorated with healthy plants and the lack of the necessity of thinking about their watering. The times where a product was created first and then you had to find applications for it are starting to change. The Lean Startup trend states that a product should be a solution to a problem or a response to a customer’s needs. Hence, it is important for creation of a product or service to define what problems your recipient faces in the area associated with your product or service. A study of the needs of customers should expand the knowledge relating to their problems and should keep in mind their reasons. Example: a software house is one of your customers, offering programming services for large corporations. When you conduct content marketing activities, most software houses focus on subjects that directly precede outsourcing of programming services, e.g. what IT company should be selected to the cooperation, which market will be best, etc. When you learn the problems of recipients in detail, you can take it one step further and find out about matters related to acquiring innovations at corporations, problems relating to remote work, difficulties regarding staffing and involvement of employees, methods for reducing costs of employment, etc. Materials prepared this way will respond to the daily problems, which are faced by 2 groups of recipients who make decisions about service outsourcing: HR Managers and people responsible for investments (e.g. General Manager, Investment Manager). When you are aware of the problems of customers and their sources, in your marketing activities, you can act before they make a shopping decision and build brand awareness at a very early stage of customer acquisition. This increases the chances of using your services when a customer is ready to find a proper business partner. As you can see, Lean Marketing methods can be applied virtually in most companies, also in activities performed by marketing and PR agencies. Benefits from their use are clear and this is only a sample of activities that can be performed using Lean methods. Beata Mosór-Szyszka — Co-Owner of Project: People (www.projectpeople.pl), strategist, she specialises in Lean methods. Project: People (www.projectpeople.pl) specialises in creating business strategies and outsourcing business services (marketing, PR, HR, etc.) It implements Lean approach to teams and projects, it designs and executes training courses, workshops and simulation games dedicated for business and education. The article under title changed by the editorial office “No more waste”, was published in the Marketing w Praktyce (Marketing in Practice) magazine №06/2017.